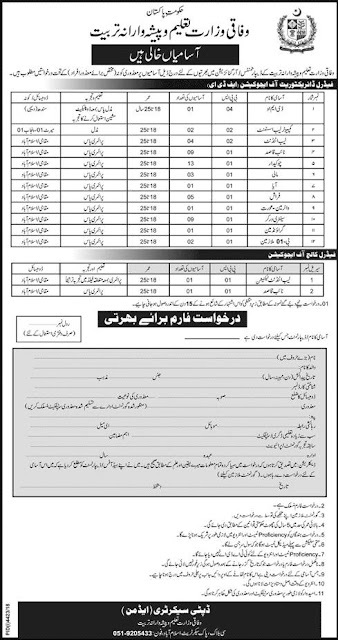 Opportunity is available in Ministry of Federal Education and Professional Training jobs 2019. Applicants are required to apply for the following posts which include such as DMO, Computer Lab Assistant, Lab Attendant, Naib Qasid, Chowkidar, Mali, Aya, Farash, Water Man, Sanitary Worker, Ground Man, and Lab Technician in Islamabad. The overall qualification of Intermediate, Matric, Middle and primary pass candidates can apply with relevant skill in the similar capability is required to apply and fill these posts directly. 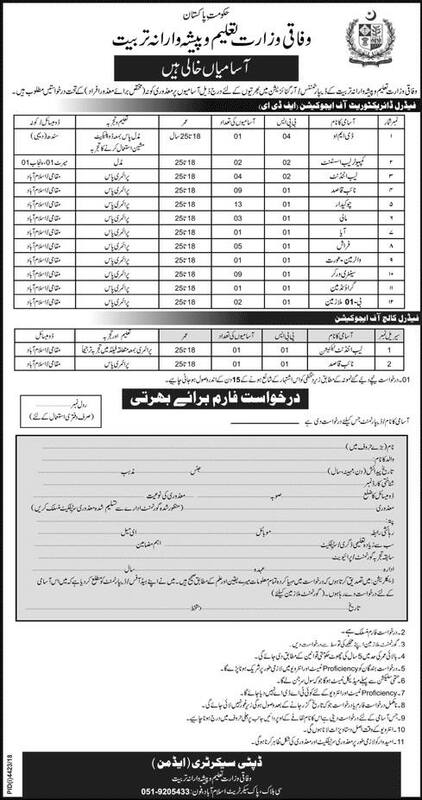 Jobs in Ministry of Federal Education and Professional Training Both Male and Female can eligible for apply for these jobs. If you have an intermediate, matric & middle degree within any relevant subjects, formerly you are suitable for these jobs. If you are jobless and want to get a good & suitable job, then you should apply to these jobs. The interesting applicant can apply before this Date April 06-2019. This is a government job. Let’s have to check out the information such as Name of available posts or vacancies, required qualifications and age limit, and No. of total vacancies. How to Apply for Ministry of Federal Education & Professional Training Jobs 2019? All the eligible candidates achieving the required criteria are invited to fill out the application form which attached with a given advertisement. For further information, you can see the advertisement attached below & Along with it you will find the application form.